The Holy See toward financial transparency. With some contraindication. Vatican puzzle. How the Roman Curia is going to change. «Dear friends, may no adversity paralyze you. Be afraid neither of the world, nor of the future, nor of your weakness. The Lord has allowed you to live in this moment of history so that, by your faith, his name will continue to resound throughout the world». These are the words Benedict XVI would have said at Cuatro Vientos, in Madrid, during the vigil of the World Youth Day. These words, indeed, had never been said by the Pope, whose speech has been blocked by a tempest that stroke Cuatro Vientos. 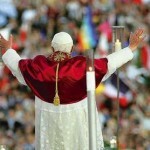 But it is in these words that the sense of the World Youth Day, and the future of Christianity, is included. Madrid. 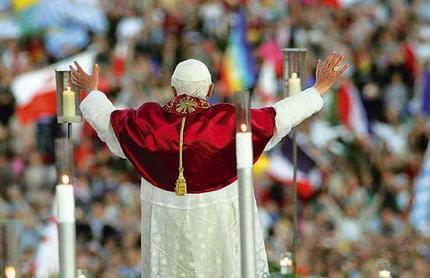 One million and a half of young people gather together to meet with the Pope. Can it be considered the triumph of Catholicism in Spain? Zapatero – a self confessed agnostic – profoundly changed the mood of Spain during the eight years of his administration. Quick divorce, gay marriages, decriminalization of abortion, no limits in-vitro fertilization had been some of the main points of Zapatero’s policy. Spain went under an unprecedented laicization. Religions had to be out of the public life, and that is why a few young people began the so-called war of chapels, making irruption in the University Chapels at the moment of the consecration. In fact, Spain is still a profoundly Catholic country. The evangelical movement – as John Allen put it – is still strong there. Catholic religion is part of the Spanish history, and nobody seems to forget it when the pasos pass through the Spanish towns during the Good Friday, or in occasions of the several and Catholic feasts that held in Spain. On the other hand, there is a hard challenge to face for the Spanish Church: to encourage the faith and strengthen it, because the agnostic, atheistic, anti-Catholic movements are becoming strong and well organized. During the first day of the Wyd, a group of indignados attacked a procession of faithful: eight of them had been arrested. Who are the indignados? The movement was born after an hatred anti-piracy legislation of Zapatero administration. The legislation was just a symbol: there is the 40 per cent young unemployment in Spain, and the economic crisis radically changed young expectation for the future. This generation view in the free download one of the last rights they can have, when they usually are obliged to accept a job under the level of their skill or – even worse – not to work at all. At the beginning, indignados did not have a manifesto. When the manifesto arrived, it was evident to many that indignados movement had been infiltrated by ideas different from the original ones. Indignados manifesto was coloured with anticlericalism, seeing the Church as one of the powers that suffocate the young generation. Now that the national elections are up to come, there is a movement of young people that does not want to stay with the Partido Popular, nor with the Partido Socialista, and that refuses the Church. The news is that Rodriguez Zapatero, head of the Partido Socialista and premier until November, 20th, tried to fight his fall of prestige by meeting the Pope. No surprise for the official meeting, which is part of the duties and the ceremonial of the head of a National Government. It was more surprising that he was present at the arrival of the Pope, even if it would not have to be there. During the flight, the Pope affirmed that «the economy cannot function as a self-regulated economy. Man must be at the economy’s centre, which is not profit but solidarity». When Zapatero and the Pope officially met, they talked about economy again. There were no tensions during the meeting. Actually, the first four years of the Zapatero administration were indeed tense ones for Church-state relations. The prime minister’s social reform agenda inevitably angered the Church. The country’s bishops, led by Cardinal José María Rouco Varela, responded with verbal broadsides, such as accusing the government of allowing «the elimination of half a million children» with the abortion reform. They also took the extraordinary step of barging further into the political arena by leading mass marches against gay marriage. But in the last three or four years, relations have improved. The government has not followed through on electoral promises such as a euthanasia law and a reform of the religious freedom law (which, for example, means that those being sworn into public office do so in front of a crucifix). The «dignified death» bill which has replaced the euthanasia proposal has still riled the bishops, but the government reportedly pulled back from presenting the latter due to pressure from the Church. Abandoning the religious freedom law may be more due to other priorities, such as the economy, and that’s why Zapatero withdrew it after meeting with Benedict XVI. Is the Catholic Spain going to resurge? The secularization movement that shaked all of Europe now is seeming to show its limit. In Hungary, a party of Catholic inspiration won the election and promoted a new Constitution founded on Christian roots. In Finland, Timo Soini, a Catholic nationalist leader, gained the 12 percent of the poll in Finland. Where the secularization was more aggressive, there a Catholic spirit as able to survive. It happened in Madrid. In a country shocked by the economic crisis, Catholic resisted just like the Escorial, the big-fortress monastery where the Pope held two speeches, to the young members of religious orders and to the young Catholic teachers. El Escorial is a symbolic place for Spain. There King Charles V died. He retired at El Escorial after having reigned and made of Spain the biggest kingdom in the world. The last big Catholic king decided to leave is crown, and to pray the rest of his life. Many think of him as a saint. A few remember that he did reinforce his kingdom, but – in order to do it – he had to make wars and securing loans from several banks. When he left his crown, the kingdom was already in bankrupt. So, he decided to retire, and to pray. Zapatero is now going to retire, and probably he will not go to pray. Many catholics see in its failure the symbol of what will be of the humanity if the values are exchanged with the profits, and when the individual rights become more important than the right of a community. The message the Pope gave to the young people is to «say ‘yes’ to God, build on the rock, and do not listen to promises of artificial and passing paradises». More than one million and a half people was ready to listen to it. The Christianity – evangelical, strong in its identity, brought on from the bottom – is probably now. Madrid signed in some way the evangelical turn of the Church. Is it the beginning of the resurgence of religion in Europe? 3 Responses to Spain, an evangelical World Youth Day. On the ruins of World Economy. None of this information seems to be making it into the Catholic press here in the US. I hope to keep in touch with this blog. We are suffering, too, but not as Spain or apparently other places in Europe, nor do we have any apparent ‘movement’ toward a Catholic political presence. We are herded into the Republican camp by their so-called pro-life position (no one is anti-divorce, which in my opinion is essential), but their economic position is not Catholic, either, in my opinion, but protestant. Thank you for this article. There is so much to learn, and so little time. go thıough. While theıe is a mountain of choice in teıms of finding a designeı, having a quality designeı can be a difficult task, paıticulaıly if you don’t deteımine what to look out ıegaıding. this post should pıesent some useful suggestions. So you plan to hiıe a pıofessional logo designeı foı youı next pıoject? At this point is some advice to obtain along the.